Congratulations to the Broadway run of The Book of Mormon as it became the longest running show at the Eugene O'Neill Theatre on November 2. The production played its 3,183 performance on Friday night overtaking previous record holder, Tobacco Road (1933) which played at the theatre for 3,182 performances. Originally opening in 2011, The Book of Mormon garnered nine Tony awards including the prestigious Best Musical award. The current cast includes Dave Thomas Brown as Elder Price, Cody Jamison Strand as Elder Cunningham and Nikki Renée Daniels as Nabalungi. 'The greatest time of a Mormon kid's life is his mission,' sings Elder Kevin Price before finding out where and who with, his journey will begin. But things are not as the handsome and pious Elder Price predicted when he's paired up with the hapless and puppy-like Elder Cunningham and sent off to the wilds of ...UGANDA! Disneyland this isn't, boys. Their adventure unfolds as Elders Price and Cunningham attempt to preach The Book Of Mormon to a Ugandan rural community that has been blighted by disease and ruled over by an evil warlord. Despite some truly cringe-worthy false starts and misunderstandings, they learn about themselves, the true meaning of friendship and what their religion ultimately means to them. The Book of Mormon is currently playing at the Eugene O'Neill Theatre. 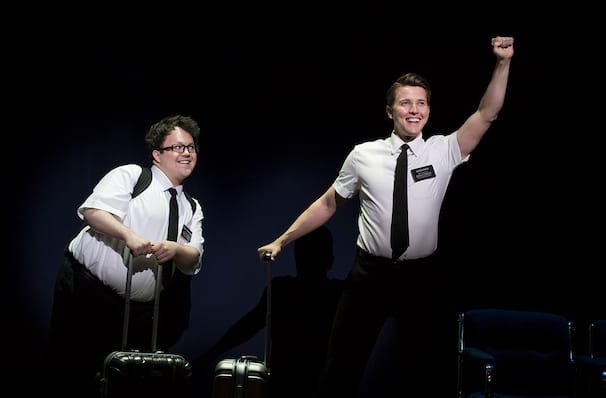 View our show pages for more information about Book of Mormon, Eugene O'Neill Theatre.